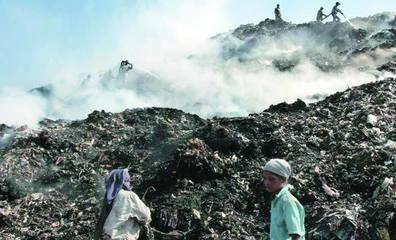 New Delhi, the capital city of India, has major shortage of municipal waste disposal facilities. The Delhi High Court intervened and instructed South Delhi Municipal Corporation to acquire new landfill sites in 2014 . The high court, concerned by the pollution caused by the existing landfill sites, in its hearings pushed different municipal agencies to coordinate and find other sites . In May 2014, Delhi Development Authority-DDA has released a list of seven new sites in the areas like Dwarka, Maidangarhi and Rohini . South Delhi Municipal Corporation was to get four waste management sites from DDA. After this announcement, Maidangarhi residents have started protesting as they feared that the proposed ‘sanitary landfill sites’ will cause severe problems including air pollution and water contamination. Their movement was supported by the Delhi unit of Congress Party. Congress leaders strongly opposed the proposed landfill site. They alleged that this proposed landfill site is a conspiracy of Bharatiya Janta Party led DDA. Congress leaders along with the local villagers convened ‘maha panchyat’ (large gathering of villagers) and decide to continue their movement until the decision is withdrawn . According to Congress leaders, the proposed landfill site in Maidan Garhi will severely affect the nearby colonies and housing societies. About 10 lakh villagers in these colonies will be affected. Beside this, the proposed landfill site is near the two universities, Indira Gandhi National Open University (IGNOU) and the newly established South Asian Association of Regional Corporation (SAARC) University. Above all, the site is situated on the ridge areas, which is already recognized as the protected areas in Delhi. So the proposed site will severely affect the local ecosystems . Project Details Presently Delhi produces about 9,000 metric tons of waste every day. It is estimated that in the next seven years the city will produce about 18,000 metric tons of waste per day. The sites were approved by the DDA in its 7th Technical Committee Meeting held in May 2014. The requirement of the change of land use of these sites was cleared by the Technical Committee in its meeting 21st May 2014. The sites were identified after undertaking joint inspections by concerned officials . Out of these seven sites, five sites will be given to South Delhi Municipal Corporation, one to Delhi Metro Rail Corporation and other two to North Delhi Municipal Corporation. The areas were allocated as follows 12 acres at Dwarka, two sites of 8 acres in J zone Maidangarhi near IGNOU. The other two sites totaling 6.5 acres are at Rohini will be given to NMC and DMRC . Other Health issues related to polluted water and soil. Why? Explain briefly. The already established three landfill sites (about 164 acre) are inadequate. The existing ones at Ghazipur, Okhla and Bhalaswa are already overflowing with garbage. In spite of this, different municipal agencies are using the existing landfills even after the Delhi Pollution Control Committee banned dumping of garbage there. Presently with its full capacity Delhi requires about four times of this area (about 650 acres). Hence, the city is in urgent need of few alternative landfill sites. . Looking at this acute shortage of space, the Delhi High Court asked Delhi Development Authority (DDA) to hand over four alternate sites. Four such sites are identified in Dwarka and Maidangarhi. However, the Maidangarhi sites provided by the DDA are found to be the forest land . The authorities have yet establish alternative landfill site despite strictures from courts .